On February 27, 2014, I posted regarding a court of appeals case which I believe misstated Wisconsin’s joint custody law. The Wisconsin Law Journal just published my article which explains my reasoning in a bit more depth. Here is how that plays out: If the parties don’t have disputes on any of the six covered areas (permission to marry, permission to drive, permission to join the military, non-emergency medical procedures, choice of school and choice of religion), there is no problem because joint legal custody is a nice term with no practical meaning. 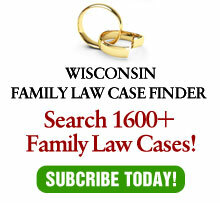 Since most of these issues are never in dispute, the nice term “joint legal custody” does not create problems in most cases. Where there is a dispute however, the solution is for the court to either award decision making in that area of dispute or terminate joint legal custody entirely and award sole legal custody. For example, if there is equal placement and both parents want the child to attend school in his/her district, the court has to choose one parent to make the decision. The irony arises if a parent without equal placement asserts his or her right to make a decision. Since the court will almost always award decision making to the parent with primary placement, the effect of asserting this right will usually be to lose any right entirely. If the non-primary parent knows this, he or she will never assert that right and life goes on. So, for most cases, joint legal custody is a nice, feel good term with little practical effect. OTOH, it rarely does any harm. A little good and no harm is better than the legal system does in a lot of other instances.